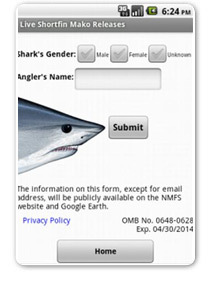 The Release Mako App was created for fisherman to report their catch and releases of shortfin mako sharks in real time. The NOAA Fisheries Shortfin Mako Live Release Program started as a website. The idea was to create a public outreach campaign to have fisherman submit their shark catches to promote the live release of shortfin mako sharks. NOAA would then take that information and visually display it on a Google Map as a “brag board.” The original reporting form was on a webpage, but there was a desire to make it easier to report on the water. A mobile app appeared to be the ideal solution. NOAA staff decided to develop an app on the Android platform using a rapid development tool, App Inventor, because they had limited resources and programming expertise. They wanted to take advantage of the email and GPS functions on mobile devices. The app would need the ability to store information when fisherman were at sea and away from a wireless connection to record on the water actual GPS coordinates of where they released the shortfin mako shark. The App Inventor development was cost effective and quick. The app has the intended functionality and the submission form is easy to fill out and operates like the online submission form. The app also includes information about shortfin mako stock status, fishing regulations, FAQs, and safe handling and release guidelines. The app uses a device’s built-in GPS, when available, to fill in exact location coordinates on the shortfin mako live release data form. The catch and release reports submitted via email allow fishermen to put their mako on the Shortfin Mako Shark Live Release Interactive Web Map. Plan lots of time for internal review, especially if this is the first app developed by your organization. Using free, cloud-based services can give you the tools to jump-start your project. The Release Mako App took approximately 3 weeks to develop and 6 additional weeks for approval. Once you build an app, you need to promote it heavily. An iOS version of Release Mako was released in June 2013.